OAuth is everywhere. The ubiquitous “Login with Facebook, Twitter, Github, etc.” can be seen in almost every web app we come across. Tools like Auth0, Netlify Identity, Firebase and Okta make it pretty simple to add these login buttons to most apps. But, what if we need some custom functionality for our app these identity tools don’t provide out of the box? Like every answer I will give, you can write a serverless function to handle that! We’ve previously explored how to building serverless CRUD apps with FaunaDB, and how functions work together with Identity on Netlify, but today we’re going a step further and discuss serverless OAuth flows. This post will focus on how to use simple functions to handle OAuth login flows for your application. We will be using Intercom in this post, but the same pattern applies to any OAuth provider you might need for your application. Let’s see how we can use Intercom alongside Netlify Functions to build a “Connect with intercom” button for our application. All the code used in the post can be found here in the repo. Add ‘login with Intercom’ via Netlify Functions & OAuth! 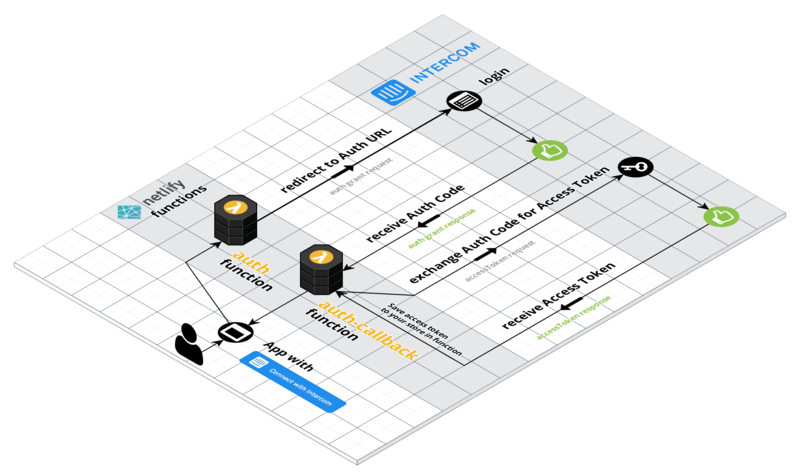 This project sets up a “login with Intercom” OAuth flow using Netlify Functions. You can leverage this project to wire up Intercom (or other OAuth providers) login with your application. Let's get started with how to get setup with the repo and with Intercom. Lets go ahead and setup the Intercom app we will need! After enabling the test app, you can find it listed in your intercom developer portal. We now need to configure the test app. Input the live “WEBSITE URL” and “REDIRECT URLS” in the app edit screen. 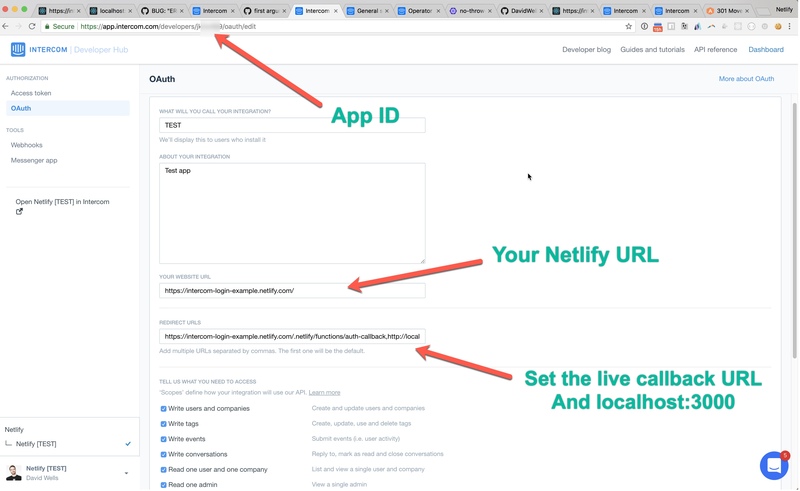 You will want to have your live Netlify site URL and localhost:3000 setup to handle the redirects for local development. Great we are all configured over here. We need our Intercom app values to configure our function environment variables. 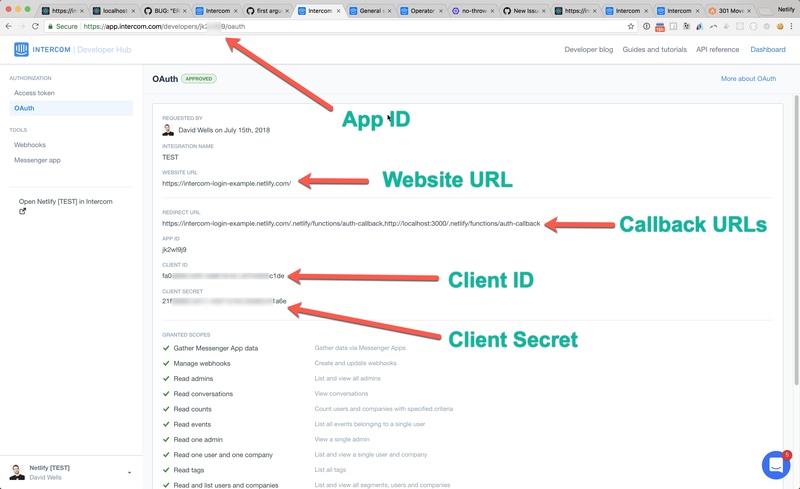 Navigate back to the main OAuth screen and grab the App ID, Client ID, and Client Secret values. We will need these to run the app locally and when deploying to Netlify. 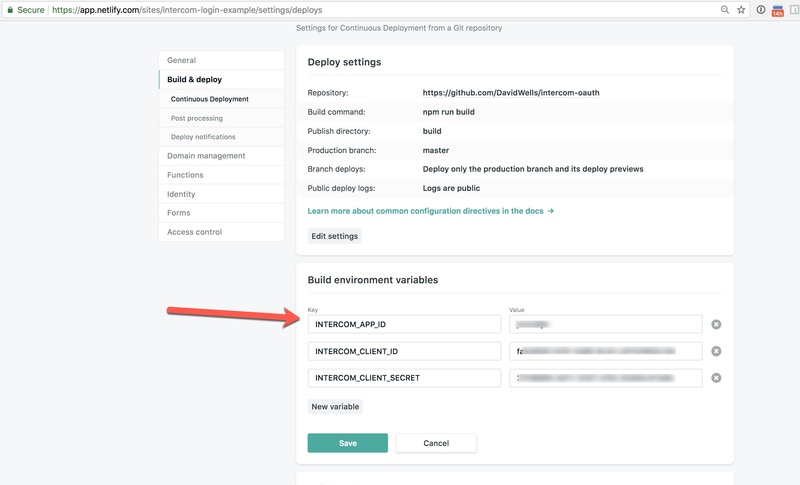 Because we are using netlify-lambda to build & serve functions locally, we can work on this project without needing to redeploy to reflect changes! We need to set an Intercom app id and OAuth client id + secret in your terminal environment for the functions to connect to your Intercom app. After creating and configuring your Intercom OAuth app, it’s time to plugin the required environment variables into your local terminal session. This will boot up our functions to run locally for development. You can now login via your Intercom application and see the token data returned. Making edits to the functions in the /functions will hot reload the server and you can iterate on building your custom logic. Use the one click “deploy to Netlify” button to launch this! Alternatively, you can connect this repo with your Netlify account and add in your values. 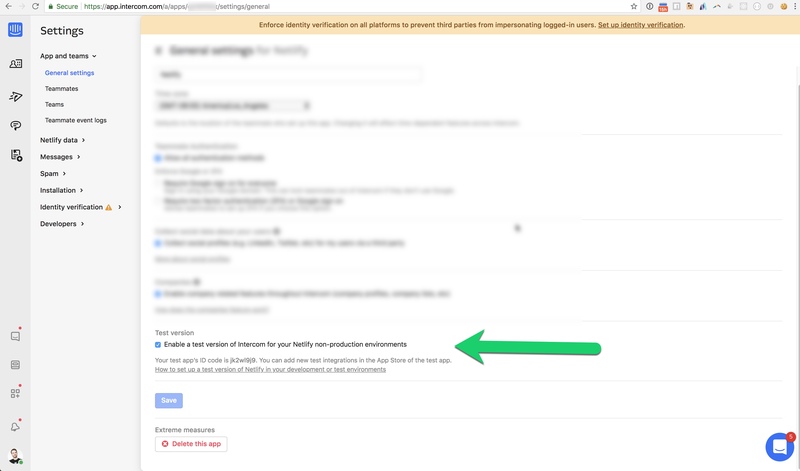 After your site is deployed, you should be able to test your Intercom login flow. Once again, serverless functions come to the rescue! We will be using 2 functions to handle the entire OAuth flow with Intercom. auth-callback.js now has the AccessToken to make any API calls it would like back into the Intercom App. Let’s dive into the individual functions and how they work. The auth.js function creates an authorizationURI using the simple-oauth2 npm module and redirects the user to the Intercom login screen. Inside of the auth.js function, we set the header.Location in the lambda response and that will redirect the user to the authorizationURI, a.k.a the Intercom oauth login screen. The auth-callback.js function handles the authorization grant code returned from the successful Intercom login. It then calls oauth2.authorizationCode.getToken to get a valid accessToken from Intercom. Once you have the valid accessToken, you can store it and make authenticated calls on behalf of the user to the Intercom API. Using two simple lambda functions, we can now handle logins via Intercom or any other third party OAuth provider. This pattern can be used to connect with any number of third party OAuth providers that you might need for your next application. We hope you give Netlify Functions a spin and see all the cool things you can build.